Hello Main Street Gazette readers. Today we are leaving the parks to explore a dessert at Captain Cook’s in the Polynesian. I think this particular quick service restaurant is one of the best on property and I am always excited to try the unique menu items you can find there. So when I heard about the chocolate beer cupcake, which combines two of my favorite things, I knew I had to make a stop to try it out. The cupcake itself is quite pretty. 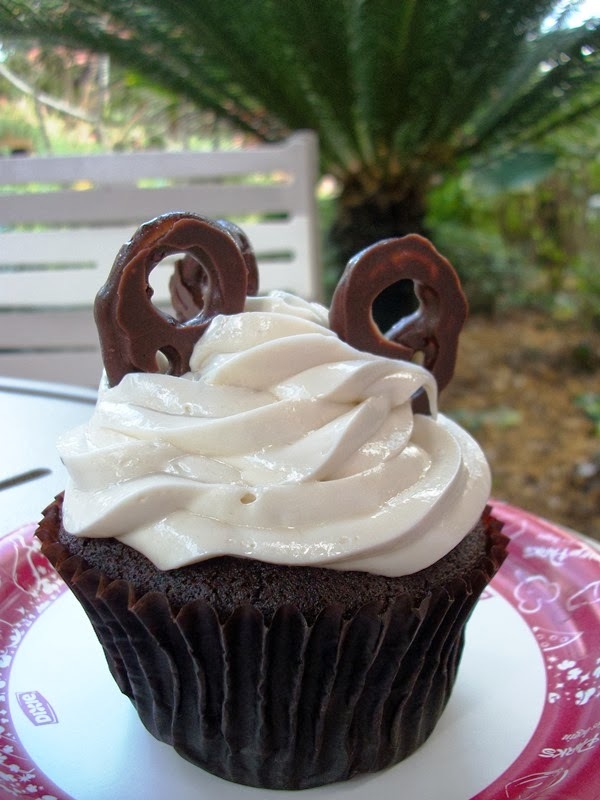 It has a chocolate cake base, glossy buttercream frosting and is topped with 3 chocolate covered pretzels (as a nod to beer and pretzels). I spoke with one of the bakers and they use Kona Brewing Company’s Pipeline Porter in both the cake and in the frosting. The porter is Kona’s darkest beer and uses 100% Kona coffee beans in the brewing process for the porter. This actually excited me quite a bit since this is my favorite of their beers and I thought it would add great flavor to the dessert. Unfortunately, I was extremely disappointed. I love beer and I love cupcakes but I felt like this one fell flat. The cake itself was ok but honestly just tasted like slightly dry chocolate cake. The frosting had an amazing texture that would have been enjoyable but it tasted overwhelmingly of beer, and not in a good way. I thought the one saving grace would be the chocolate covered pretzels (one of my favorite snacks) but they were stale and far from satisfying. So, what is the final verdict? I would not order this cupcake again. I have had amazing versions of this sweet outside of Walt Disney World but sadly the chocolate beer cupcake at Captain Cook’s was missing the depth of flavor needed to combine beer with dessert and in the end just tasted like cake and frosting with beer that had been added as an afterthought. My advice; try one of the other amazing cupcakes Captain Cook’s offers and drink a beer with your dinner. You will be much happier you did.